Heavy-duty welded steel construction with precision-tapered bearing for jib boom rotation. Trolley and hoist not included. NOTE: Customer must ensure unit is properly installed and floor strength is adequate to support job crane usage. Power turning cantalever crane of model BZ is a kind of crane matched with power calabash of model CD1 or MD1.it is mainly made of stand pole, turning arm and power calabash. The under end of stand pole is fixed on concrete base by feet bolts. Turning of cantalevel is driven by cycloid pin-wheel reducer. Power calabash moves in line on the turning arm and rise clog. The turning arm is manual driven. With of simple structure, small voltage,large work scope, easy operate, flexible turn, this kind of crane is fit for fixed place such as shipside, warehouse, workshop. 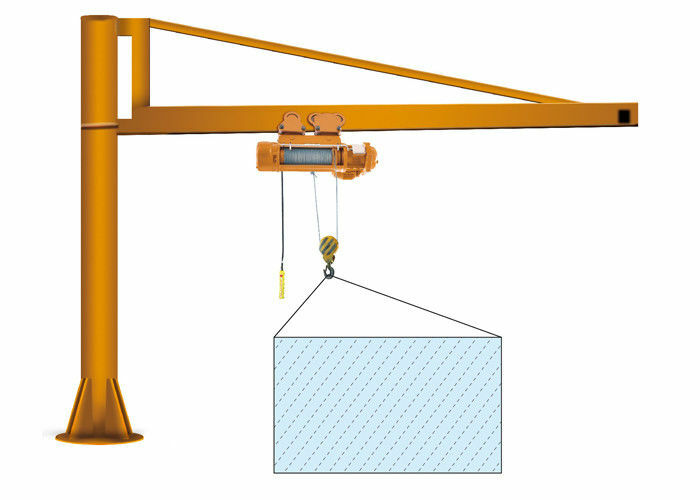 This kind of cranes has safety protector and ultimate protector and is a very perfect kind of cranes.